Sayfullah Al-Sheeshaani, a/k/a Abu Sayf Al-Sheeshaani, the Chechen pig before the descent into Hell for the big pig roast, lays serenely with his body burned to a crisp at the hips to his feet. Rodent-pig Abu Sayf Al-Sheeshaani (far right) during happier times with fellow feral swine. More facts are coming out of the area of the Central Prison where a group of Chechens, trying to prove themselves worthier than the inept hodge-podge of Saudis, Qataris, Kuwaitis, Tunisians, Moroccans, Libyans and Azeris, in the bloodletting department, wound up registering this operation in the SNAFU Department. And, unfortunately for the accursed Chechens, the blood this time was theirs. This was a completely Chechen operation with rats who spoke the same language to avoid confusion. Many Chechens know basic Arabic and can sometimes blurt out sentences in formal Arabic, but, it is a fact that Syrians and other Arabs have difficulty understanding them. Even more troublesome is a Chechen rat trying to bark out orders to a fellow Arab rat during an emergency resulting in mixing of languages with attendant confusion. This operation was designed to avoid such problems. So far, 90% of the rodent carcasses are from the Caucasus. The operation was to follow a familiar pattern similar to that at the Al-Kindi Hospital, to wit, sending a suicide bomber/driver in a truck loaded with explosives – having him floor the pedal to achieve maximum speed before he is either killed by light weapons or by premature detonation. Following the track of the vanguard vehicle is the attack force. In this instance, the Chechens, some of whom had served in Russia’s military, knew how to drive T-62 tanks. There were 3 such tanks, fully refurbished by British and Chechen rodents. Behind the tanks was the “strike force” inside flat-beds or pick-up trucks, some carrying 23mm aa machine gun cannons. The attacking force was estimated at 600 with a back-up complement of 1,000 belonging to JI. The tanks were initially used to strike at the towers of the prison to take out any ability to surveil the ground. For this, the Chechens and Brits drilled the drivers and gunners on accurately firing at angles sufficiently far to strike the towers. Once the tanks got too close to the walls of the prison, the angles would be impossible for the tank cannons. The cannons on the T-62 (an older type) do not depress as easily as those of the T-72 so adjustments had to be made for trajectory. It sounded like a fool-proof plan. It was also unusually intense in that the Chechens deployed more rodents than ever before in attacking the prison. This was to be their moment of glory – a demonstration of their superiority as Jihadists fighting for their notion of a counterfeit Islam. Here’s what went wrong. The tanker truck used was listed as missing by the MI people weeks ago and there was a suspicion that it was taken to Turkey. Imagine how pleased MI spotters were to espy the truck moving at a speed of close to 45 mph in an area where all truck drivers know there are security agents everywhere. It was clear that the truck had a driver who was up to no good. Moreover, the suspension was pressed down indicating an unusually heavy load. As it turned out, the heavy load was not because of the 12,000 kgs of TNT and C-4 but because of the metal stuffed into the truck’s container designed to cause as much human suffering as possible. The driver of the truck was detected early on by MI who alerted guards at the prison. The guards here are not complacent. They are very much aware of the importance of being on their toes and RPGs were instantly readied. The SAA commander inside the prison, immediately contacted a fellow officer who was nearby in the Hanaanu area and asked for help. The colonel knew it was going to be a repeat of the Al-Kindi operation. More than that, once HQ was informed of the situation, SAAF Sukhois took to the air carrying kitchen-grade thermobaric bombs to be dumped on the rear lines of the rat force. The RPG gunners at the walls were told exactly what to look for. Visibility was fine and they had orders to shellac any truck appearing within range. As the trailer truck, with its suicide driver and payload charging at the west gate of the prison, the RPGs, all 7 of them, unleashed at stream of missiles, each striking the truck across its breadth and causing the vehicle to explode at a distance of about 100 yards from the prison walls. The blast was so strong, 2 officers of the SAA who were looking at the scene through binoculars were killed instantly by the wave of fire. Then, with merciful suddenness, elements of the 6th Mechanized Armored Division opened up a hail of artillery that, along with the barrel bombs, decimated the rear flanks of the terrorist rat units causing them to flee northwards toward the Turk border. But, the SAAF did not let up and harried them until they were only 5 kms from the border. There is no question that the number of rodents killed exceeds 500 but the counting has not begun yet because of sniping and other organizational issues. Along with the 2 martyred officers, 10 soldiers were injured and 5 inmates were killed. Damage to the prison towers is substantial and work has started already on repairing them and the western wall which took the brunt of the explosion. This operation was not planned by Sayfullah Al-Sheeshaani. Evidence now indicates that contractors for the SAA, the British equivalent of the Green Berets, were involved in obtaining intelligence about the defenses at the prison and providing the necessary explosives. The amount of explosives carried indicates clearly nation-state involvement. But, as I just learned, this operation was being monitored by the MI weeks before it took place and the evidence now indicates that British planners at Incirlik were intimately involved in setting it up. According to Wael, the British have a high opinion of the Chechen rodents because, as Wael says, they are “whiter” than the Arabians and seem to have a better grasp of discipline, tactics and execution. So much for that. FAMILIES RETURN TO THEIR HOMES IN DAMASCUS SUBURB! Mu’adhdhamiyya: At least 1200 families have returned to their homes after terrorist rodents and cowards threw away their weapons to grasp at any deal under Dr. Assad’s Amnesty Program. This deal had nothing to do with Geneva-2 and was worked out between the government and the murdering rats who were at starvation status. where is the video about the prison battle, I want some footage. this stuff must be recorded for posterity, someone parachute a video camera into the prison. we need to see this sort of stuff, its very good for morale, as well as being very destructive to the wahabbi cannibal morale. Longlive servants of zionists look at syria . Wait and see 2 even 4 new syrias in the near future . This is a war well planned one by Cia mossad experts .keep killing each other.esad only serves israel by killing his citizens. Thanks once again my friend for the Truth on what’s happening in Syria. 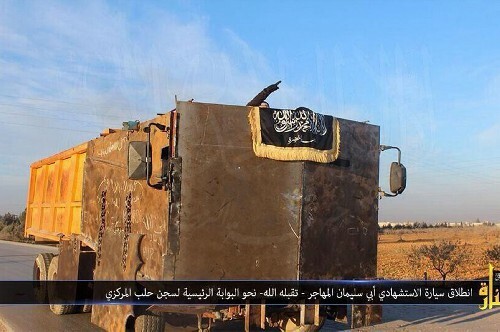 This is apparently the truck which led the attack. Seeing that intergalactic garbage scow driving around you really couldn’t mistake it for anything other than what it is. Trouble. How incredible stupid are those so called ‘freedomfighters’ ! Ziad my friend thank again for the good news. Soon the Saudi imported desert rats and the Chechen cockroaches will be expelled form Syria the proud land of the Lions and Lionesses. I must say I am a little jealous because I would love to have been the one shooting in that Wile. E video. I would have been happy to kill a few of those filthy extremist cowards of perverted Wahhabi Islam. They represent the worse of the animal kingdom and need to be eradicated or used as food for the zoo animals. LOL! zaid,many countries during world wars made the soil boggy.this slowed down infantry and their armoured units.study about this and suggest saa as saa is facing suicide cars and vehicles at epidemic rate. One of Bahrain’s 36 Jews, Nonoo says she has never been discriminated against in her country, where woman are allowed to vote, choose to wear a headscarf and even drive. The appointment of Houda Ezra Ebrahim Nonoo (46), the first female Ambassador from Bahrain and the first Jewish Ambassador of an Arab country in Washington, was praised by U.S. diplomats when it was revealed recently in one of the Wikileaks cables. Sana reported yesterday that scores of terrorists were killed in Adra, when they say ‘scores’ they usually mean 50 – 200 or more. Do you have any news from there Ziad? have a nice day.